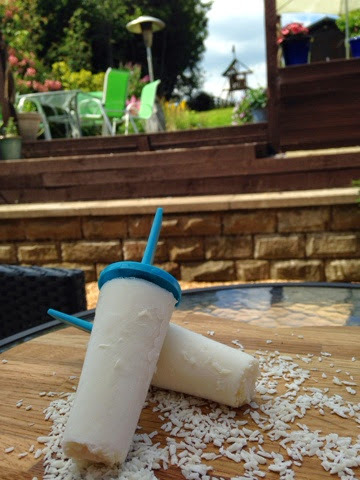 After my success with my lovely refreshing Pimms Lollies, I decided to try Coconut rum Lollies. I love Malibu and Bounty Bars so thought I would try to make something of a combination. 500g of fat-free greek yoghurt with a touch of honey. They taste great, just the texture I wanted to achieve. They are more of an ice cream consistency than a lolly, so were quite filling. The Pimms Lolly is much more refreshing, where the coconut lolly felt more indulgent.